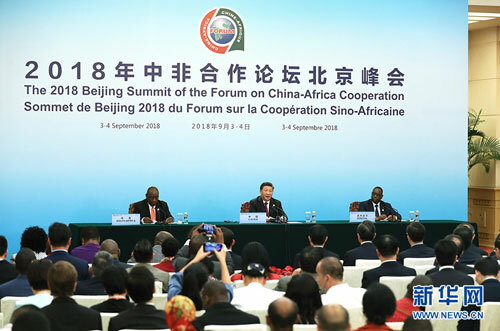 BEIJING, Sept. 4,Chinese President Xi Jinping on Tuesday met the press together with African co-chairs of the Forum on China-Africa Cooperation (FOCAC) as the 2018 FOCAC Beijing Summit concluded. Xi was accompanied by South African President Cyril Ramaphosa and Senegalese President Macky Sall, presidents of the previous and sitting African co-chairs of the FOCAC. Xi made the announcement that the 2018 FOCAC Beijing Summit has come to a successful conclusion. The summit issued the Beijing Declaration -- Toward an Even Stronger China-Africa Community with a Shared Future, which crystalized consensus of China and Africa on current major international and regional issues, and sent the world a strong signal of the two sides going forward hand in hand, Xi said. The FOCAC Beijing Action Plan (2019-2021) was also adopted at the summit to confirm that China and Africa will comprehensively enhance pragmatic cooperation focusing on the implementation of the eight major initiatives, Xi said. All FOCAC members agreed to jointly build a China-Africa community with a shared future that assumes joint responsibility, pursues win-win cooperation, delivers happiness for all, enjoys common cultural prosperity, ensures common security, and promotes harmony between man and nature, which will set a model for the building of a community with a shared future for humanity, Xi said. All FOCAC members agreed that China-Africa relations have embarked on a distinctive path of win-win cooperation and are at their best in history, Xi said. China and African countries are willing to enhance the alignment of strategies and policy coordination, push forward the joint development of the Belt and Road, and closely align the Belt and Road Initiative with the African Union Agenda 2063, the United Nations 2030 Agenda for Sustainable Development and the development strategies of African countries, Xi said. All FOCAC members agreed that China-Africa relations have demonstrated unprecedented cohesiveness, vitality, and creativity. China will continue to adhere to the principle of sincerity, real results, affinity and good faith, and uphold the values of friendship, justice, and shared interests, and push the in-depth, solid, steady and enduring development of the China-Africa comprehensive strategic and cooperative partnership, Xi said. All FOCAC members also agreed that China-Africa cooperation is part of international cooperation with Africa. In conducting cooperation with Africa, all parties of the international community should respect African countries' sovereignty, listen to Africa's voice, take Africa's stance seriously, and deliver on commitments made to the continent, Xi said. The forum was established 18 years ago. The successful hosting of the Beijing Summit has brought China-Africa comprehensive strategic and cooperative partnership to a new historic starting point, and on a new journey, Xi said.